This interactive periodic table of the elements is a launchpad for information about all the elements. Click on the element symbol to view a page containing facts and data concerning that element. A list of the elements in order of atomic number or an alphabetical list is available. There are also many printable periodic tables and periodic table desktop wallpapers available as well. 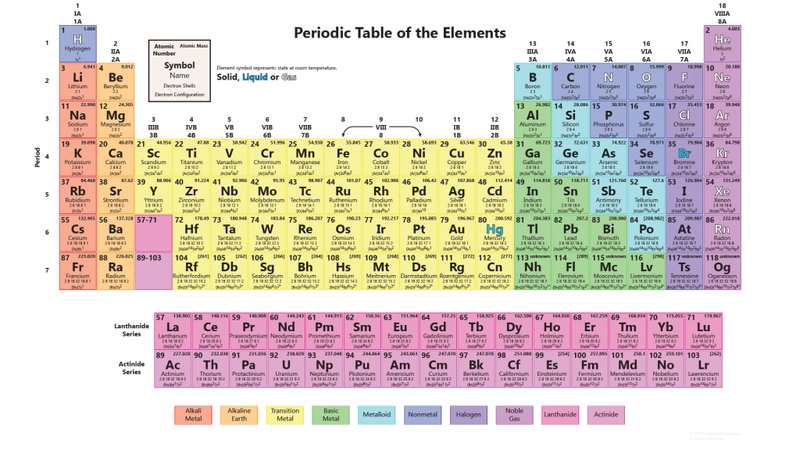 If you just need element facts and figures, like atomic number, element names and symbols, electron configuration, and state of matter, you may prefer to use this comprehensive periodic table. It’s not an interactive table, but cites most of the pertinent information needed for chemistry calculations and other scientific problems. If you click on the image, the table will blow up to full size on your screen, so you can read the atomic masses, etc. Note: Currently, many of the element links on the interactive periodic table go to About Chemistry‘s element facts pages (which we also wrote, of course).